The Apioceridae are a very cute group of “flower-loving flies” that is in Australia represented only by the nominal genus, Apiocera, with 4 subgenera. 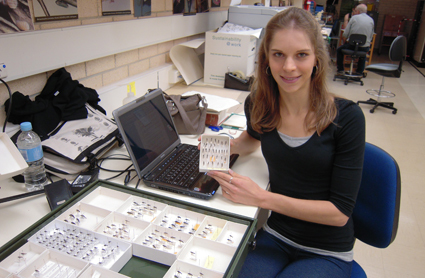 Apiocera (Apiocera) occurs solely in Australia and is divided into 13 groups based on morphological traits. The A. minor group comprises 6 described species, but has not been taxonomically revised since Paramonov (1961). The group is easily distinguished by its reduced alula in the wing, broad vertex in the male, long proboscis, and faint mesopleural hairs. I am currently working on a revision of the A. minor group, describing at least 5 new species and preparing an identification key to all the species. Images taken of the wings, abdomens, and genitalia have shown remarkable differences between the species and have proved most useful in species identifications. 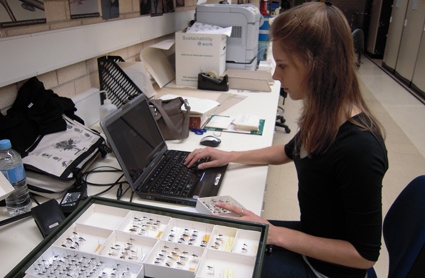 I am also databasing the Apiocera specimens in the ANIC and of other collections to gain access to their locality and other collection details and, most importantly, allow the generation of distribution maps. 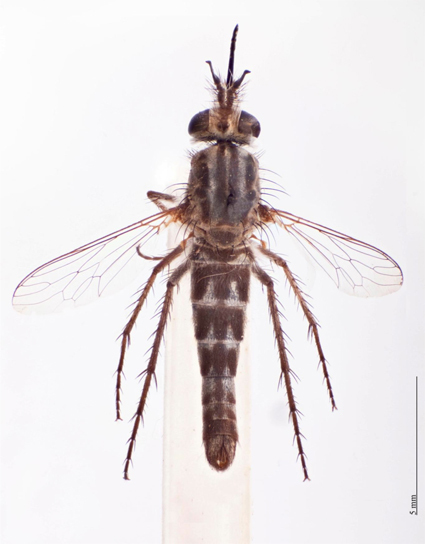 My work on this group will add important information to the REVSYS project in terms of the species diversity, distribution and phylogeny of asiloid flies. Apiocera (Apiocera) mullewa in dorsal view. Photographed by Stefanie Oberprieler.